Color: Adults are light brown. Mature larva are white. Characteristics: Oval shaped with antennae that are serrated or saw-like. Head and thorax are bent forward so that they have a strong humped appearance. Size: Adults are approximately 1/16” – 1/8” long. Adult cigarette beetles are oval in shape and are yellowish-brown to reddish brown in color; they can grow to be 1/10th of an inch in length. Cigarette beetles have serrated antennae and have wings; they are fairly strong fliers. Their heads are bent downward giving their bodies and overall humpbacked appearance. The larvae of the cigarette beetle are off-white in color, smaller than the adult and have a worm-like appearance. Why Do I Have A Cigarette Beetle Problem? Appropriately named, cigarette beetles attacks tobacco wherever it is stored. Like other stored products pests, cigarette beetles also infest paprika, dry dog food, beans, biscuits, cottonseed, dried fruits and vegetables as well as dried flowers, grains, herbs, peanuts, rice, yeast and even furniture stuffing. What Are The Signs Of A Cigarette Beetle Infestation? If carpet beetles have invaded your home you will more than likely see the brown colored beetles flying around it, especially in the early evening hours. You may also start to find holes in food packaging, there may be debris coming out of the holes from where the larvae are feeding. What Kind Of Threat Do Cigarette Beetles Pose? The cigarette beetle does not carry any known pathogens, but a large infestation of these pests can cause serious problems for a food processing facility. Cigarette beetles do not bite, sting, or transmit any known diseases. Cigarette beetles are mostly considered to be nuisance pests, but can cause damage to items found inside of homes as they live and feed. Cigarette beetles will damage items like books, book bindings, dry flowers, wreaths, and stuffed furniture. They will also contaminate food that is being stored in your home, food items that they invade include: pasta, flour, seeds, dried fruit, dried fish, and dry seasonings. Cigarette beetles are also known to feed on pyrethrum which is an active ingredient that is found in insect baits and insecticides. How Do I Control Cigarette Beetles? Because cigarette beetles are found in our food supply, only properly trained professionals should treat infestations. Also, do-it-yourself pest control treatments and products may be harmful to people and pets if misused or mixed improperly. If you’ve noticed insects in pantry items or have plant workers reporting infestations, please contact Holder’s Pest Solutions for effective stored product pest control in Houston. How Do You Prevent A Re-infestation? There are several things that you can do around your home to help prevent a re-infestation of cigarette beetles. Making sure to discard any items from your home that have been infested by cigarette beetles is a very important first step. If any infested products are left in your home your problem with cigarette beetles will quickly re-surface. You should regularly rotate dry goods that are stored in your kitchen; and make sure to store dry goods in plastic or glass sealed containers instead of their original packaging. Also, make sure to thoroughly wipe down and clean pantry areas and kitchen shelves to remove any food debris. 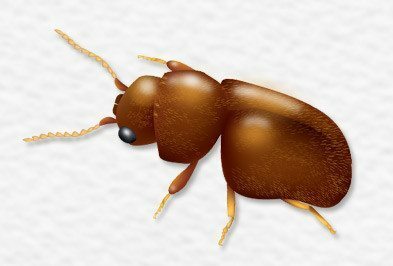 Holder’s Pest Solutions can help by providing effective stored product pest control services to help eliminate current problems with cigarette beetles and prevent a re-infestation within your home. Technology can be a pretty amazing thing. Such is the case with Doppler radar. Doppler is used to monitor cloud cover and rain potential. It is so sensitive that it can tell how heavy or light the rain will be, if there is lightening or hail in the storm, or if there is a rotation indicating a tornado. Radar can detect wildfire smoke, bird migrations, and even bats. Amazing! But, did you know that it can also detect bugs. That’s right, bugs! Whether you cook in your home, or run a 5 star restaurant, this blog is for you. Pantry pest prevention is simple: seal pests from entering the areas where you keep your food, protect your food, and don't carry pests in. If you follow these three basic rules, you won't have to worry about beetles, weevils, moths, and other food infesting bugs. A lot happens around Thanksgiving time. More people will be coming and going from your home and more food as well. It is a time of celebration and a season of feasting. It is also a time when those bugs and rodents will start wondering if your home is the right place to spend the winter. If you're wondering, the answer is no. Your home is not the right place for those critters and varmints to spend the winter.